Dry and itchy skin is never an option. It is generally the dry and harsh weather that is to be blamed for such skin conditions. The harmful UV rays from the sun also add on to skin problems. Using sunscreen help you to a large extent hence. The market is full of reliable brands with sunscreen lotions available for all skin types, from dry to normal skin or good or sensitive skin. We have come up with a list of the top 10 best sunscreens for dry skin in India. But before going through the list here is a tip that will come handy while selection: Always choose sunscreens that does not clog pores and that offer high SPF. 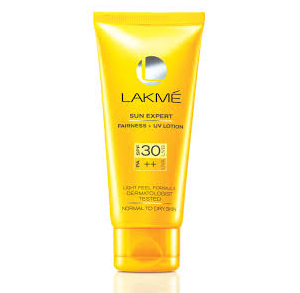 Lakme Sun Expert Sunscreen Lotion protects your skin from drying out in the sun. It creates a kind of protective shield against your skin and keeps it moisturized and nourished. It also acts as a skin whitening lotion to help you retain your body glow. 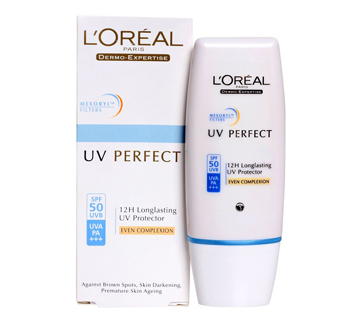 L’Oreal Women UV Perfect 12H UV Protector work on dull and dry cells to rejuvenate it. The moisturizing content keeps the skin healthy and hydrated and protects it against brown spots and aging signs. It works to keep your skin safe against day to day pollution. 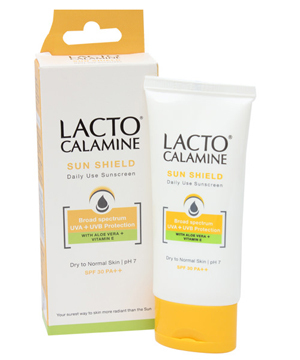 Lacto Calamine Sun Shield is dipped in the goodness of vitamin E and aloe vera and work against dark spots, pigmentation marks and other skin related problems. It also protects the skin from harmful radiation and helps you retain the pH balance of the skin. Kaya Daily Moisturizing Sunscreen is a moisturizer and a sunscreen at the same time. The moisturizing elements nourish and rehydrate your skin while the sunscreen element protects you from harmful UVA and UVB rays of sunlight. 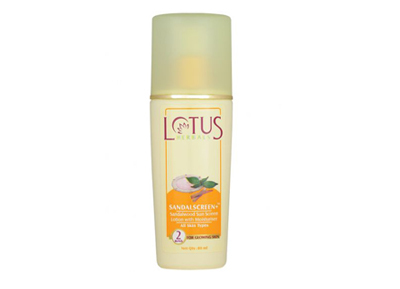 Lotus Herbals Sandalscreen is also a mixture of moisturizer and lotion works on all skin and mends dry and dull ones by keeping it hydrated. Some of the herbal ingredients include sandalwood, sweet basil and cuscus grass that protects against UVA and UVB rays of the sun. You get a matt finish touch on your screen after every application. 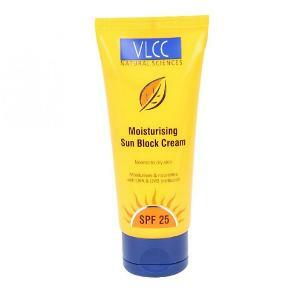 VLCC Moisturizing Sun Block Cream with SPF 25 acts as protective shield against UVA and UVB rays. The Jojoba Oil, Sandalwood extracts, aloe vera extracts, evening primrose oil and wheat germ oil content provide nourishment and hydrates the skin. Also these active natural and organic ingredients make your skin flawless. 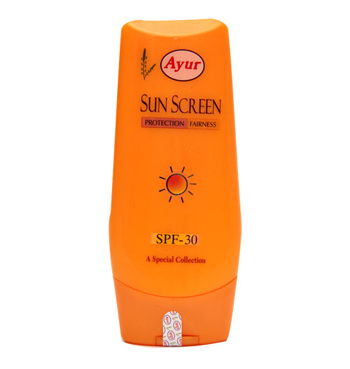 Ayur Sunscreen Lotion is non greasy and there are no oil signs post application. It protects your dry skin against sun damage, pigmentation and other skin related problems. This skin whitening lotion makes your skin look healthy and fresh all day long. 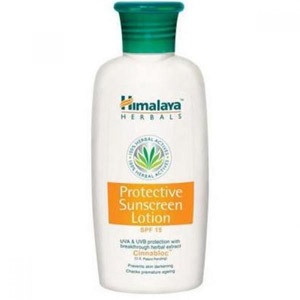 Himalaya Herbals Protective Sunscreen Lotion is made up of active ingredients like Aloe Vera, spiked ginger lily, crab apple and greater galangal that keeps your skin hydrated and protect you against UV. It prevents skin cell degeneration and works as a protective shield all day long. 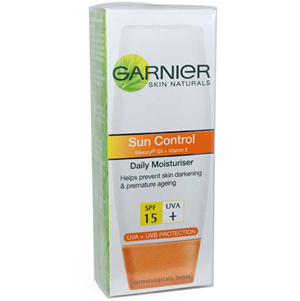 Garnier Sun Control Daily Moisturizer is a moisturizing lotion and protects the skin against premature ageing. The rich vitamin E, extract of coriander and glycerol content helps retain skin moisture and serves as a UV protection shield. 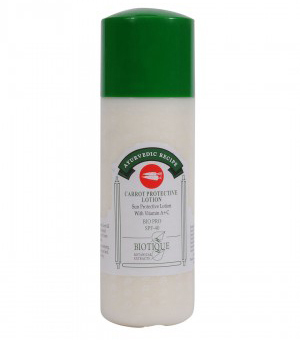 Biotique Bio Pro Carrot Protective Lotion is enriched with ingredients like Parijat, Singjerahata, Lodhra, Yashad Bhasm Zind Ash with herbs and Carrot. These organic contents keep the skin hydrated and healthy. It also works against dark spots, patches, blemishes and other dry skin related problems. I have dry skin and i want to use everyday basis of sunscreen so which sunscreen lotion is suit for me on my skin. I have dry skin.. . . .so plz tell me which sunscreen to use my skin. .plz plz plz. .
hi every body lotus SPF30++ suites well for all skin types. but we have to use regularly. If u have dry skin .always use sunscreen lotion with aloe vera or with moisyuriser. Avoid any othr cosmetics… Better to be use herbal products. Avoid overuse of soap.facewash..